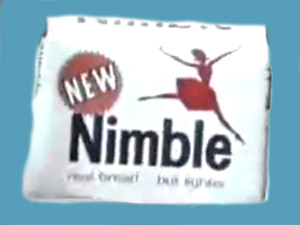 Although still going strong today, Nimble Bread is perhaps most strongly associated with the famous advertising campaign of the late 1960s and 1970s that featured Nimble girl Emily Jones precariously perched on a small chair secured to a red and white Nimble balloon. Accompanied by the memorable ‘I Can’t Let Maggie Go’ by Honeybus, something about the ad caught the public’s imagination in a way rival firm Slimcea’s own balloon based bread commercial singularly failed to do. The product itself harks back to an age when the amateur ethos still prevailed in the sport of dieting. Phrases such as ‘lean cuisine’ and ‘calorie controlled diet’ were about as technically complex as things got. Nimble boasted it was only 40 calories a slice (that’s apparently 27 calories less than normal bread), although it probably helped that each loaf was absolutely tiny. The writers of the most recent Wallace & Gromet adventure remembered the ads quite well. didn’t Nimble do an ad of a pretty blonde girl coming up a hill with a loaf of Nimble bread, similar to that of the boy in the Hovis advert? It wasn’t just that the loaves were tiny, it’s more that each slice seemed to be 3% dough and 97% air.